Although I wrote everything I know about squirrel issues for this website, oftentimes a problem with squirrels in the attic is beyond the scope of the do-it-yourself homeowner to solve. I have found a professional company in Fort Lauderdale, Florida that handles problems with wildlife. Nuisance Wildlife Rangers has access to tools, techniques, and experience that help them do a far better job at wildlife removal than a non-experienced homeowner could. They possess licensing that allows them to do certain types of work legally, that non-licensed homeowners in the state of Florida are not allowed to do. For the welfare of your situation, and the squirrels, in some cases it's best to hire a pro. There are good companies and bad companies out there. I've done research on such companies, to get to know them, and feel confident recommending their services. I therefore recommend a company called Nuisance Wildlife Rangers which services Fort Lauderdale, Florida. If you have a squirrel problem, or any other conflict with a wild animal, and live in Fort Lauderdale, I am confident that this company, Nuisance Wildlife Rangers, is the one to call. I asked the company to describe their service range, and they said this - Our range includes North Lauderhill, Sunrise, Plantation, Weston, Davie, Lauderdale Lakes, north to Pompano Beach, Oakland Park, and Wilton Manors. Nuisance Wildlife Rangers operates 24/7, so don't hesitate to call at any time to discuss your wildlife problem, and schedule an appointment for same-day or next-day service. To Whom It May Concern, I need so help with a squirrel issue. I came home from work my wife found a baby squirrel running around in our bed room. We believe it found its way in from the laundry room , which I am guessing came in through the garage ! I was able to catch it by killing it. Could this mean I have a nest some where or just one that got in the house. There are no noises in the attic. Please advise what I need to look for or can do for prevention. Thank you for your time in advance. Hello, I talked to someone in your company early last week about squirrels in the attic. We want to have a one-way door installed on a hole leading into the house. (I believe a mom was in there, raising babies, but they should be full-grown by now?) The person I talked to asked that I send a picture of the house. The hole is above the gutter, on the top, left-hand corner of the house. A 32 foot ladder should be fine for reaching it from the porch roof. A picture of the house is attached. I've CCd the owner of the building. Dear David, I am emailing you after reading your website and want to verify the plan I have has a chance of working. (Actually, my wife was reading your site while I was climbing up and down a ladder.) So we have been hearing scratching noises from our vaulted ceilings in our house and I investigated to day. I am including a picture of what I found. (So Labor Day really does involve work!) My plan, based on the steps listed on your site, is to put up a mesh netting over most of the break in the wood, and leave an opening. On the opening I will install a one-way-door to make sure the squirrels get out but do not get back in. If I am reading your list correctly, the problem should resolve itself in a few days? After I do not hear scurrying anymore I will replace the damaged soffit. Finally, if you have any other suggestions, guidance, or opinions please feel free to tell me. If you have a squirrel problem in Broward County Florida, or any other conflict with a wild animal, I am confident that we can solve it. 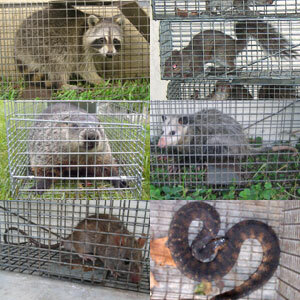 We use humane methods when dealing with Fort Lauderdale wildlife removal situations. Squirrel Control Fort Lauderdale. Our company is fully licensed and insured in Florida. Call us any time at 954-703-5683 for a price quote and to schedule a same-day or next-day appointment to solve your squirrel problem in Fort Lauderdale.